Patient #17, a 73 year old right-handed white male, presented to the Department of Neurology with a one-and-a-half year history of progressive left hand dysfunction. He complained of stiffness in the arm and some quivering in the left hand. He stated that over the last year his right hand had been giving him trouble as well, especially with writing. He was forced to quit golfing and also had difficulty clothing himself and buttoning his shirts. He saw an outside neurologist who started him on carbidopa/levodopa without improvement. Specifically there was no improvement in stiffness, tremor, or use of the left hand. There were no side effects, but the medication was discontinued after one month secondary to lack of effect. The patient stated that his speech had increasingly slurred, that he was unable to get words out quickly, and that he was talking less. He attributed these symptoms to depression. He also had difficulty with walking, and was falling (sometimes falling forwards and sometimes backwards). The patient gave a history of urge incontinence for about one month as well as a loss of libido over the past year. However, a history of impotence per se could not be ascertained. There was no complaint from the patient or his wife of any cognitive changes. He denied headache, dizziness, numbness, weakness, double vision, seizures or other episodes of loss of consciousness, dysphagia, appetite change, fever, or weight loss. The patient's wife felt his problems started after the unexpected death of his son (one-and-a-half years prior to consultation), after which the patient was diagnosed with depression. Past Surgical History: The patient gave a history of an appendectomy 40 years ago. He had angina 10 years ago at which time he was diagnosed with hypertension and underwent coronary angioplasty. He denied angina since that time. Family History: The patient's father died at age 74 of complications related to prostate cancer. He had a gradually deteriorating mental status thought by family members to be Alzheimer's disease though he was never assessed for this. He stated his mother, age 93, was in a nursing home because of a hip fracture. The patient had one son who was obese and a heavy smoker who died of a myocardial infarction at 40 years of age. He has two daughters, one of whom had been diagnosed with multiple sclerosis but is employed and independent. A granddaughter was said to have had abnormal eye blinking in her teens which resolved without medication. There was no history of any other neurological disease in the family. Social History: The patient smoked one to two packs a day in the past but quit completely twenty years ago. He denied any prior blood transfusions, intravenous drug use, or any other illicit drug use. He was in the medical corp in the army and subsequently became a bank executive. He is presently retired. There were no evident Kaiser-Fleischer rings nor carotid bruits. The skin and general examination were normal. Blood pressure (lying): 195/115, Pulse: 75. Blood pressure (standing): 175/100, Pulse: 78 (He reported some dizziness without vertigo). Weight: 192 pounds. Mental Status: Mini-mental status score was 27/30. He was alert and oriented times three. Mood and affect seemed normal and appropriate. His speech was slightly slurred with a mild nasal quality. Language was fluent with good repetition and comprehension. In delayed memory, he recalled two out of three objects after a distraction. He performed well, initially, on serial sevens; but his function subsequently deteriorated. There was no evidence of hallucinations. 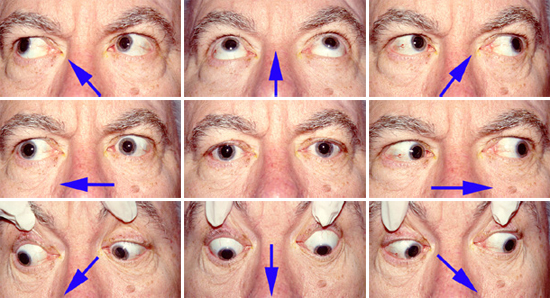 Cranial Nerves: Pupils were equal and reactive to light bilaterally. Visual acuity 20/20 at distance in both eyes. Visual fields were full to confrontational techniques but the patient's pursuit was extremely slow and saccadic. Sensation to cold and light touch were normal on the face bilaterally. The patient's face was symmetric and tongue midline. Sternocleidomastoid and trapezius strength were 5/5 bilaterally. Motor: Motor strength was 5/5 throughout and muscle bulk was normal. There was moderate lead pipe rigidity with cogwheeling in the left arm with mild rigidity in the right arm and both legs. Axial rigidity was present as well. There were slow, searching movements with his left hand while at rest. High frequency, small amplitude, regular contractions of the fingers on his left hand were present at rest. Myoclonus was not elicitable. He had difficulty pantomiming transitive and intransitive gestures to verbal command with his left arm, constantly grabbing it with his right hand to get it to do what he wanted it to. At times when attempting tasks with his left arm it would assume a dystonic posture, being elevated at the shoulder and flexed at the elbow. The patient would grab it with his right arm to bring it down. He was unable to write a sentence or copy a figure with his left hand. He had no difficulty in these activities with his right hand. He had marked difficulty following commands with his left leg. Reflexes: Deep tendon reflexes were 3+ in the left biceps, triceps, and brachioradialis; 3 in the right arm. Patellar reflexes were 3 and ankle jerks 2 bilaterally. Snout, glabella, and palmomental reflexes were present bilaterally. Sensation: The patient had slightly decreased position sense in his left hand and mild decreased vibration in all distal extremities. Proprioception was mildly impaired in his arms bilaterally. Cold, light touch, graphesthesia and stereognosis were normal. Romberg sign was absent. Cerebellar: The patient had normal finger-to-nose on the right but was markedly slow on the left. He had slow rapid alternating movements of the left hand and foot with irregular tapping of his left foot. Gait: Arm swing was absent on the left. His posture was somewhat stooped with some freezing on turning. There was slight bradykinesia and no postural instability. Tandem walk was normal.